Stay is a fibreglass guide dog, the kind that has a slot in the top of it's head, designed to raise money for the Royal Guide Dog association. In 1991 Stay was dognapped from outside a supermarket in Hobart, and was taken to Antarctica aboard the Aurora Australis. That is all true, and this book puts together a captivating story that includes many of Stay's real life adventures with some made up ones added in. This book is indeed an animal story, but for me it's more of a book about Antarctica. 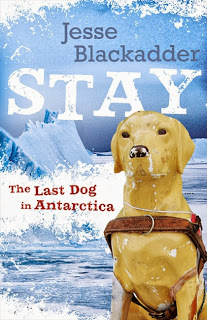 Each of the characters in the book take Stay to visit their places of work, and the characters love talking to Stay, so we get to hear all about the different kinds of work that goes on in Antarctica. We meet Chicken Chasers who do penguin research, a diesel mechanic, the captain of the Aurora, weather forecasters, weather observers, the cook and pilots to name a few. As a place I will most likely never get to visit, this book give an up close and personal glimpse at what life in Antarctica is like, and for that reason I really loved this book. There are a few other dogs that also feature in this story, the huskies. Just after Stays' arrival in Antarctica, in 1992, all of the huskies who lived and worked there were returned to Hobart, this was because of new environmental protection legislation. The old dogs stayed in Tasmania, to retire, and the younger dogs were sent to Minnesota, to continue working. While Stay, in this book, thinks of herself as a real dog, the Huskies don't agree, and one thing recorded in this story, that really did happen was that one of the Huskies weed on her when they first met! Stay is still in Antarctica, and while she doesn't come back to Australia, the money she raises does. I have included some links below so you can see more images of her, and read about some of her 'real life' adventures. This is the first in what will be a new series by Jesse Black Adder, the next book (see below) is due for release in early 2014, so be sure to look out for that one. It's a tale is inspired by the true story of the Kimberley brumbies and their journey to Dubai.